This last July, I had the opportunity to attend the Scratch Conference at MIT in Cambridge, Massachusetts. On Day 2, Austin Kleon (author and artist) was the keynote speaker. He was amazing. I really enjoyed his delivery and his message that creativity is NOT a noun...something that is a passive and is just there or not. He provides a list of ten things we can all do to become more creative in our lives (both personally and professionally). Check out this video of his keynote -- then go read his books "Steal Like an Artist" and "Show Your Work". A few days ago I signed up for a creative learning experience sponsored by the fine folks at Scratch. 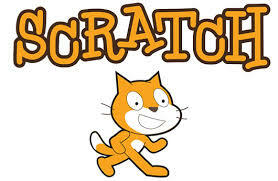 Scratch is a block based coding language created for kids by MIT. "Getting Unstuck" is 21 days of small programming challenges in Scratch, delivered to your email inbox from July 5 until July 25, 2018. 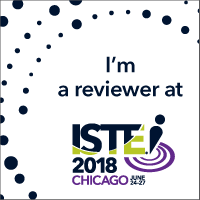 My students and I love using the program and I am excited to stretch my creativity and get some new ideas for next year! Add your Scratch project to this studio to share how you approached today’s challenge. Then, check out and comment on some other examples in the studio! A great way to learn is to study the varied ways other people imagined and programmed creative responses. Take a moment to reflect on your creative process in the Notes and Credits section of your project. What did you learn from creating this project? What did you notice about how other people approach the challenge? Here is the link to my project. I might continue to add a few things here and there -- but, for the most part, it's complete. A few weeks ago I received an email from a gentleman asking me to review the Digital Citizenship online resource (Sammy's Guide to Online Safety) his company made for elementary aged students. I get quite a few of these sorts of emails and they tend to get lost in the shuffle as I go about my day and my inbox gets more and more full. They are also using bulk emails sent to hundreds of people and not really something that applies to what I do in the classroom. This man, however, emailed a second -- and a third -- time. I was getting the hint he really thought his resource was a valuable one and that he really DID want my opinion — so I took a few moments to look at it. I’m glad I did. Over the years, I have used lots of online resources and tools to help guide my students on the quest to assure lifelong digital safety and citizenship. This is by no means a tool that can eliminate the need for all others -- but it is a nicely prepared FREE resource to add to your bag of tricks. Topics of study include Protecting Personal Information, Password Safety, Email Safety, Social Media, Cyberbullying and App Safety! Teachers or parents can provide the link for their students and have them open the site on their personal device (laptop, chromebook, or tablet). Students can use the pen tool to circle answers or draw on each page to show understanding -- there is even a typing tool that will allow them to type their answers on the page. Teachers/parents can even download all of the pages as worksheets if computers aren't available. Check out this resource and let me know what you think! Happy Surfing! The Hour of Code --- It's HERE! Are you ready? If you are like me, then you consider CSED, or Computer Science Education Week (December 4-December 10), to be an exciting week! I teach Computer Science to my elementary students all year long -- but this is the week that we can really celebrate the process of learning to program and code -- and learning all about computational thinking. If you don't know much about the Hour of Code (it's becoming synonymous with CSED thanks to code.org) -- you can learn more about this amazing movement to bring Computer Science into every school using this link. Here are some of the things that I am considering doing with my students this week. While this list isn't exhaustive, by any means, of the many resources available -- I hope you that something on this list would inspire you to try something with your students or child. 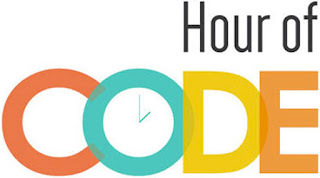 If you are still looking for more -- I would recommend looking through the activities listed on the Hour of Code website. My goal for 2nd quarter is to introduce my kindergarteners to the different parts of Computational Thinking. During our first time, we talked about Decomposition, which is taking a bigger problem and breaking into smaller, more workable parts. Check out my post on this here. This week we are talking about Pattern Recognition. Kinders are REALLY good at patterns. They must have great classroom teachers that provide some really fun lessons because they were ALL over this activity! 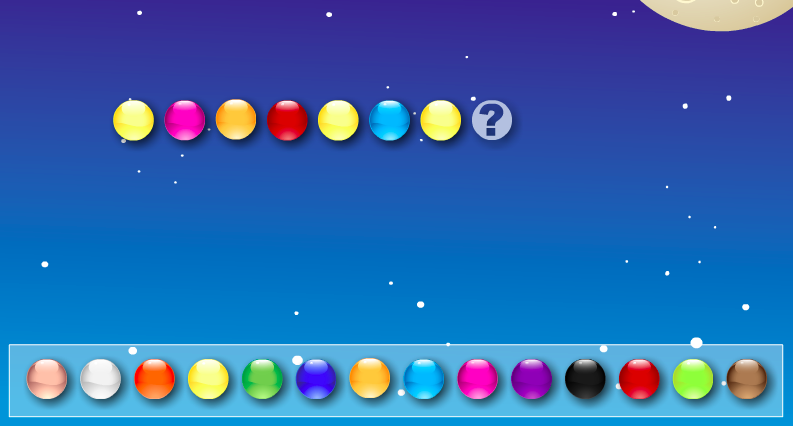 The two web activities I used are both found on my go-to collection of awesome games/activities for kids — abcya.com . Activity one was a huge hit — Moon Rock Patterns — the kids nailed this! 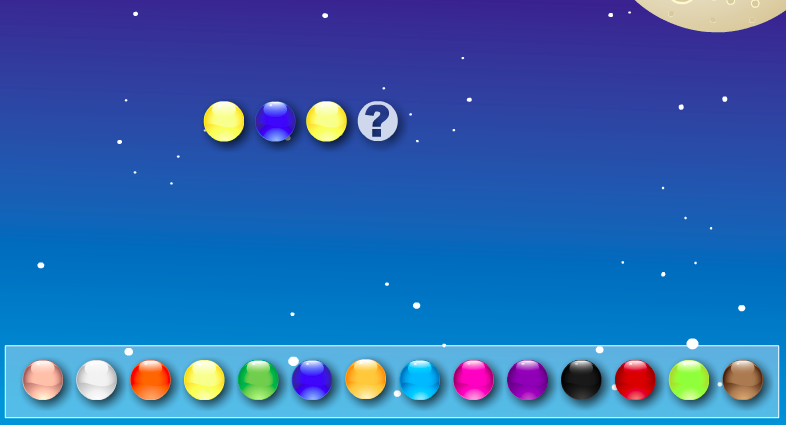 In this activity, there is a snazzy space ship that shoots across the screen and leaves colored “moon rocks” in its path. The “coder” has to use the extra moon rocks at the bottom to complete the pattern. The pattern above is from Level 1 — a very simple ABAB pattern. As the coder progresses through the levels — the patterns get increasingly more difficult. 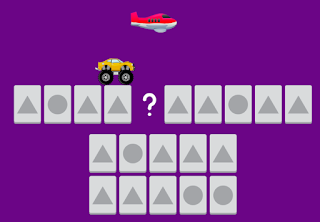 This pattern is from Level 6 and is a pattern that repeats after the sixth moon rock — ABCDEFABCDEF. I was really impressed with how well students did on the higher levels. Way to go, Kindergarten teachers! 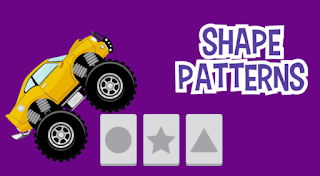 The other activity we worked on is Monster Truck Shape Patterns (also found at abcya.com!) The kinders loved the sound effects on this …..vrroooom vrroooom! 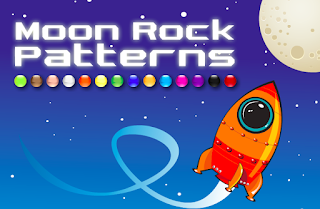 Just like the Moon Rock Patterns activity — the game starts out pretty easy. 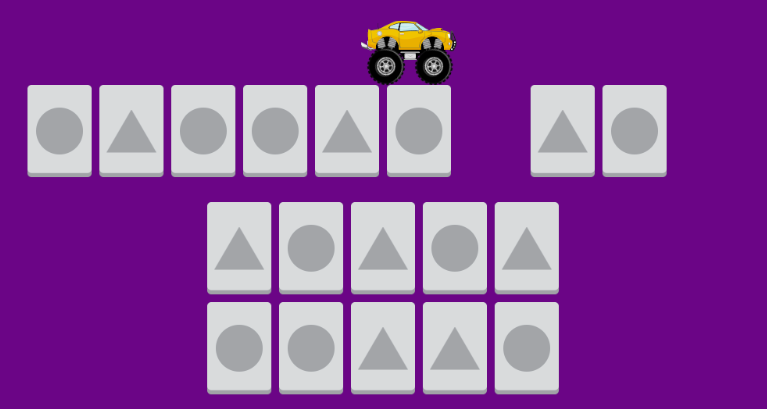 The Monster Truck has to be able to drive across the top of the shape cards. 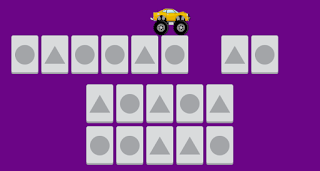 The coder needs to identify the pattern and fill in the missing pieces so that the truck can complete its ride. In this example, there is only one shape card missing and the pattern is an easy one — ABA. 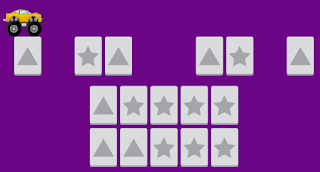 As the coder progresses through the activity — more and more of the shape cards are missing. This provided a great opportunity to encourage students to “guess and check” and be persistent. If the coder put the wrong card in the missing spot, the truck honks its horn and the card goes back to the card bank at the bottom. I also encourage my little coders to look all over for clues. In this activity, it’s sometimes best for them to look in the middle — or even at the end of the shape card line up to help identify what the exact pattern. This activity also has a really fun super challenge! After you have practiced identifying the patterns and filling in the missing shape cards, the coder can go into “RACE MODE” and complete more pattern puzzles. This time, however, they will be racing a PLANE! My Kinder-coders are pretty competitive — and did fairly well! How well can you do?? Abstraction is another one of the Computational Thinking concepts we talk about during Computer Science classes. It's an important step in creating a solution to a larger problem. Abstraction is defined as "focusing on what is important and ignoring what is unnecessary." 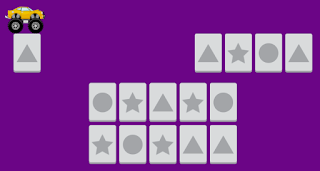 In the code.org puzzles my district uses as the core curriculum, many times students are given a lot of coding blocks and are asked to rearrange and remove any blocks aren't needed. The focus of these lessons is on debugging and the word abstraction is never mentioned in the directions or hints given within the puzzle. I mention it, of course -- but find that many of my students don't really make the connection. 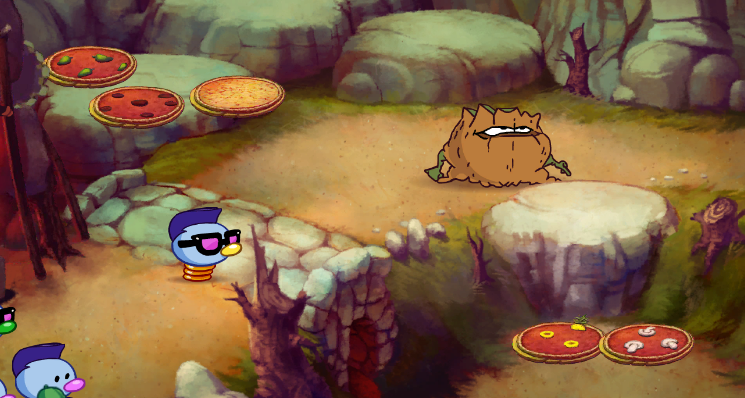 One of my favorite ways to talk about abstraction and have students practice this skill is by pacifying Arno, the almost omnivorous Pizza Troll using the program The Logical Journey of the Zoombini's. In this logic game, students are asked to create the perfect pizza for Arno. Each time you play the game he wants different toppings and you have to use the visual and verbal clues given to decide which toppings are "eewwwww GROSS" or which ones he likes. Arno blocks the path so the Zoombini's can not move on. In order for him to move, the user must use the pizza topping buttons to serve up the perfect pizza. As I teach this lesson, I encourage my students to look closely at the pizzas that Arno has been served and what he does with them. If he likes a topping, but wants MORE, he will save it for later. (I explain to the kids that I will eat a pepperoni pizza -- but I really like pepperoni and sausage. They totally get this....) If Arno, however despises a certain topping, he will throw it into the dump in front of him. In this example, you can see that Arno is not fond of pineapple or mushrooms. He has thrown them into the dump. The other toppings he likes -- so he has saved them for later. Can you decide what would be his PERFECT pizza?? Using abstraction skills -- we can tell that Arno is not at all interested in pineapple or mushroom. As the pizza maker/programmer, I would ignore those toppings and not use them in my final recipe/algorithm. The other toppings are all useful to me -- since he likes them. I would make a perfect pizza for Arno using peppers, pepperoni, and cheese. HINT!!! Presenting Arno with pizzas that only have one topping at a time is a critical act in determining what he likes. He gives very vague comments if he doesn't like an ingredient. "There is something there I don't like!" "Ewwww....Gross!" If you present a pizza with 3 toppings and only one is an ingredient he isn't fond of -- it's not very easy to guess which one it is. 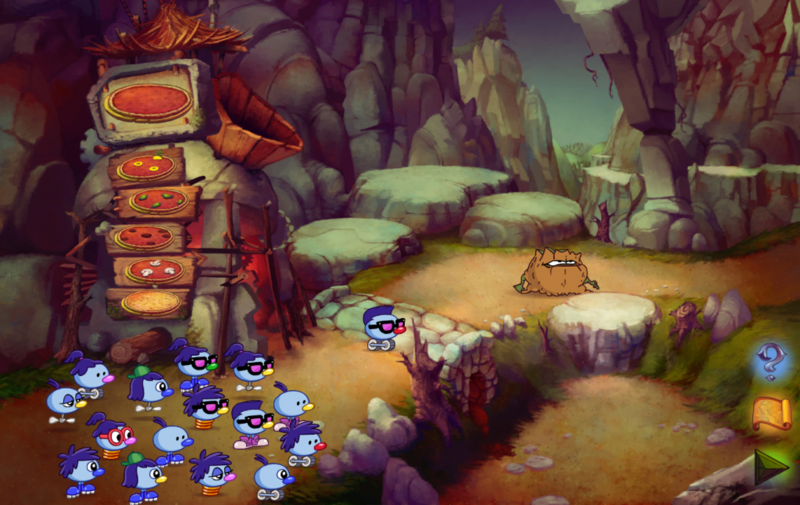 As the game levels progress -- the student is introduced to two more pizza trolls -- each with their own likes and dislikes. The pizza machine also expands to produce an ice cream dessert with up to three different toppings. In the harder levels, you will meet Arno's friends -- Willa and Shyler. Each have their own likes and dislikes. It's very helpful for students to have some sort of way to take notes and record data as they discover it. A simple table would be great. 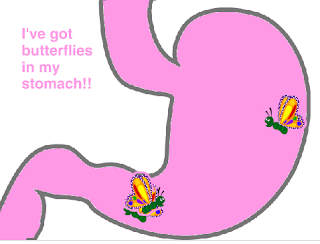 Here is one that I use with my students. Click here or on the image to see it full size and download it if you like. 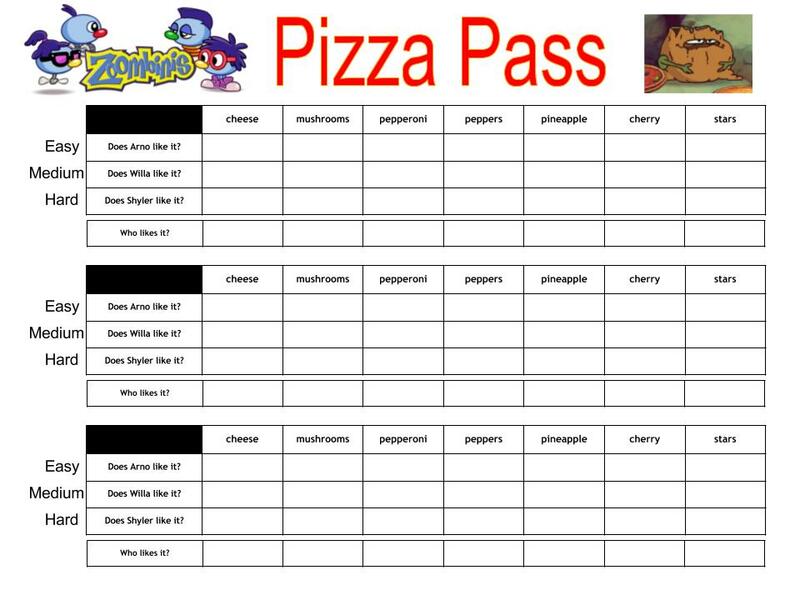 Pizza Pass is just one of the 12 amazing Computational Thinking and Logic games that are part of Zoombini's. In future posts, I hope to share some more of my favorite puzzles in this awesome program. 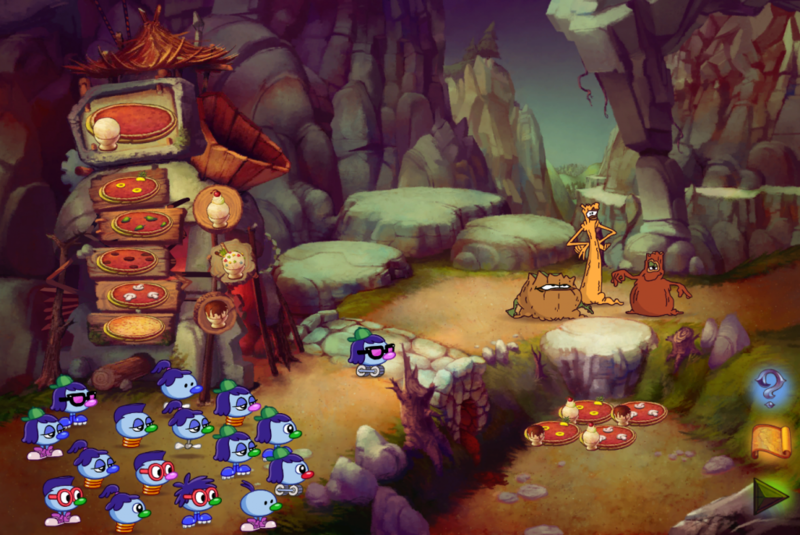 Zoombini's is available to play on STEAM (computer play) -- or via the Apple App Store or Google Play . During the last few lessons in Third Grade, we have been learning about Nested Loops. A nested loop is a loop inside of loop. We’ve used them in our Code.org lessons to move and collect things and to draw shapes and designs. As an extension, we did the Awesome Sauce Challenge in Scratch. Students were given nine blocks that they had to use in a program. They had a start block (when green flag is clicked), a move block, a turn right and left, a repeat block, a change color, a set pen size, a pen up, and a pen down. Each one must be used at least once. They can re-use any block any amount of times. They also have permission to change the variables in the blocks to make each one unique. They were also encouraged to experiment with using Nested Loops. The goal was to PLAY and CREATE a unique and amazing digital design — AWESOME SAUCE!! Check out some of our sauciest creations!! I teach Computer Science to some pretty amazing elementary kids. Much of our time is spent doing lessons, puzzles, and activities from the Code.org curriculum. We use Scratch and The Foos -- we play with Robots. We learn how to think through problems and find the most effective (and efficient) solution. To do this, we start talking about five parts of computational thinking (Decomposition, Pattern Recognition, Abstraction, Algorithm Design, and Debugging) as early as Kindergarten. Decomposition was the focus of this weeks Kindergarten lesson. Decomposition is defined as breaking something into smaller parts. 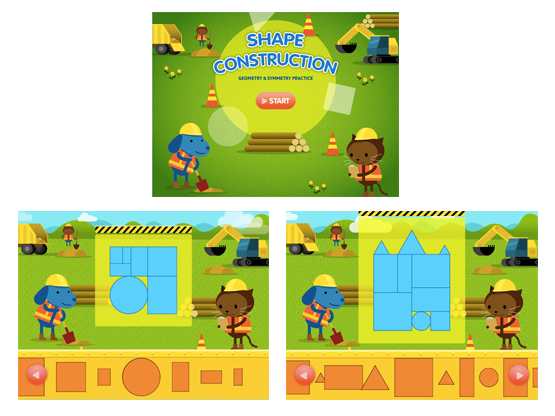 With the “littles”, I introduced the idea with the following two websites from abcya.com : Shapes Construction and Tangrams. Both of these sites use “smaller parts” to build and create a larger image. Decomposition in reverse…. so to speak. The students and I talked about all the pieces and parts that are needed to build a house. A roof! Doors! We need WINDOWS! You have to have a floor! 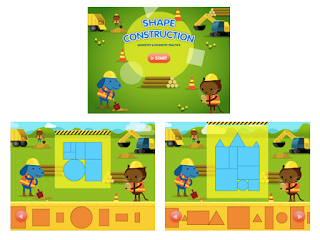 After our discussion, I opened the Shapes Construction site and we talked about the design that we needed to create. The design had been broken into all of its smaller parts and were listed at the bottom. Our job was to put the design back together. Boy — did they have fun! Adding to this lesson, I had the kids work on another activity in abcya.com. 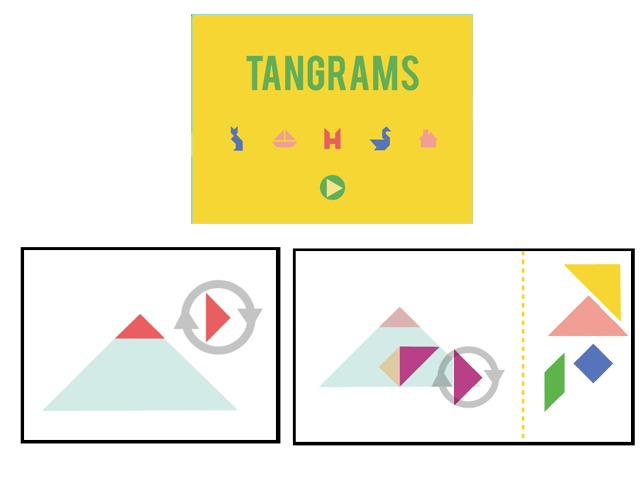 This time we went to the Tangram activity. 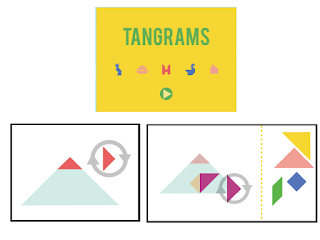 The concept is very much the same — but this time the students needed to “debug” the shapes. Many times the shape needed to be rotated to fit in the puzzle. Students had to identify which shape was needed and then how to make it fit by using the tools to rotate it. 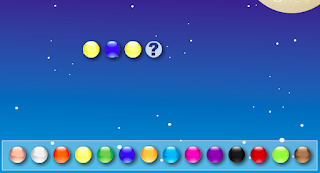 The first level was full of helps — each shape was it’s own color and the targets were clearly outlined. The upper levels became a little more challenging. First, all the shapes became the SAME color. Then, much to the Kinders chagrin — they lost the outline of the targets. they decided that they could indeed do anything they tried……..and they did. Computer programming is one of the most important skills for the future. 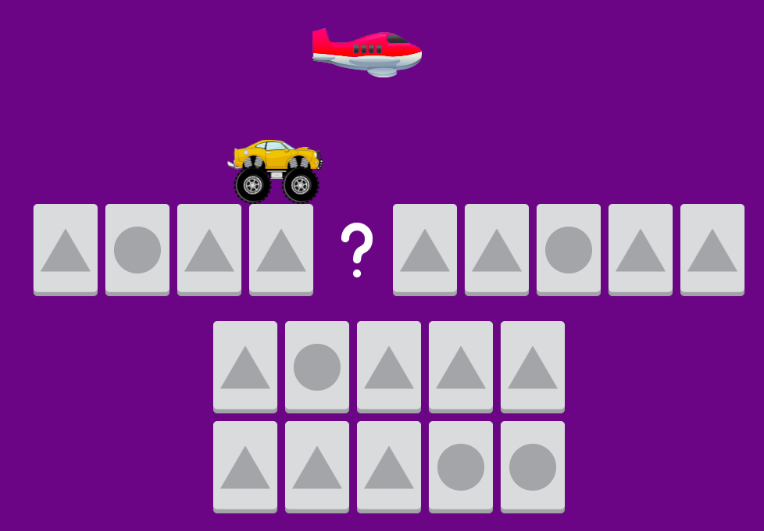 We set out to create the easiest way for kids to learn the basics of coding through something they already understand and love: building blocks. Osmo Coding uses hands-on physical blocks to control Awbie, a playful character who loves delicious strawberries. Each block is a coding command that directs Awbie on a wondrous tree-shaking, strawberry-munching adventure. This makes me SO excited. I have a couple of Osmo's in my classroom and my students have had a great time using them. Since I teach Computer Science, I am really excited about using this new component to help reinforce the coding principles that I am having my students learn. I ordered my add-on today! If you want to try Osmo for yourself -- use this link - and if you are one of the first five to do so - you will get $5.00 off any full kit that is ordered! I had the privilege of presenting yet another session with my good friend Susan Prabulos today at the NETA (Nebraska Educational Technology Association) Spring Conference. Our session today highlighted some of our favorite apps, web 2.0 tools, and other "treasures". Susan has posted our session on Slideshare, as well as providing a link to the slides on her blog The Digital Scoop! Check it out! Have fun -- reach out if you have some other great tools to share! It was right around January 2016 that I first heard about BreakoutEDU. As a fan of the Escape Room, I was intrigued but didn't really think about adopting it into my bag of tricks at school. My friend Lynne (my own personal BreakoutEDU goddess), however, convinced me after a time to give it a try and so I purchased some of the needed items to make it happen. I was excited to have them arrive. I took the locks out and opened them, turned the black light flash light on and off, unlocked and locked the 3 digit combo box.... but then, they sat. Waiting to be used..... waiting for me to find my inspiration...and the courage to try. Then, a few weeks later, the BreakoutEDU goddess (aka Lynne) invited me over to her home for a Breakout party. After three or four games, I was hooked. More importantly, I was ready to try it with my students. BreakoutEDU games focus on collaboration, teamwork, critical thinking, persistence, and logic. Teams work together to solve complex puzzles that will provide them a code or combination of letters, numbers, or directions to open a various number of locks. The goal is to break IN to a box (or series of boxes) to win the game. Any content area can be adapted and made into a BreakoutEDU game. 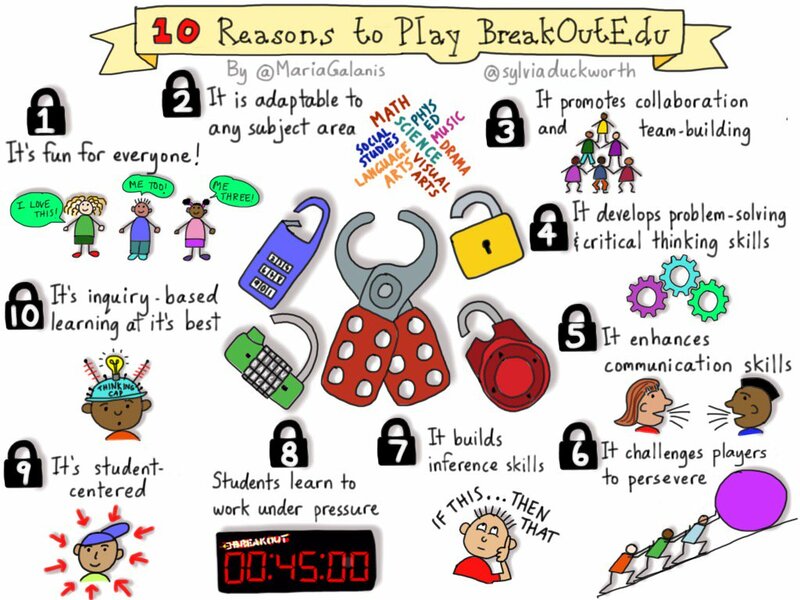 There is a BreakoutEDU movement going on and there are some really creative educators who are willing to share their exciting and innovative games. FOR FREE!!! You can learn more about how to purchase an "official" kit from BreakoutEDU.com or get them via Amazon -- and view all the lessons that have been created using this link. There is also a very active Facebook group that you can join. I have learned so many wonderful tricks from that group of educators. So far, we have tried a Digital Citizenship Breakout and one called Break the Code! The Digital Citizenship Breakout covers cyberbullying, understanding your digital footprint, copyright and fair use, and determining relevancy and accuracy of a website. All of these topics are the subject of discussions and activities I have led in previous years -- but NEVER have I seen such active participation and attention given to these topics. The students were totally invested. We did this Breakout as a full class activity. We discussed not only the content of the lessons -- but how we could use the information as clues to the locks. We discussed the process of looking for clues and how to use them to our advantage. The students, at the end of the class, were begging for another Breakout the next time we met....but they wanted to try it without my help! They were hooked! The following week, we did Break the Code. Students needed to solve some Code.org puzzles, translate a binary number into decimal, and learn about coding in schools around the world. I divided the kids into two groups (about 9-10 kids in each) and also divided the room into two halves. I had two sets of everything on each side of the room. I explained the concept of the game and went over the rules again. I also told them the boundaries of their area and told them to collaborate with their team to be the first to break into all of the boxes. At first, the kids were running amok. It was like Black Friday at Target! I was a little frightened that I had made a mistake -- but then -- miraculously, the volume settled and they started to really find their groove. There were a couple of hiccups along the way, a few exasperated LOUD sighs from students who weren't being heard the first time, and a handful of snarky remarks -- but the did it. They worked together and overcame the challenges. EVERY group broke into the boxes within the 45 minute time frame. We learned that it isn't always easy to be willing to listen to another persons ideas -- especially when we "always think we know better". Collaboration can be "exciting -- but really hard. You have to notice how other people are feeling and if they are being included". "Sometimes the answer is right in front of your face. You just have to being willing to see it." BreakoutEDU is one of my new favorite things. 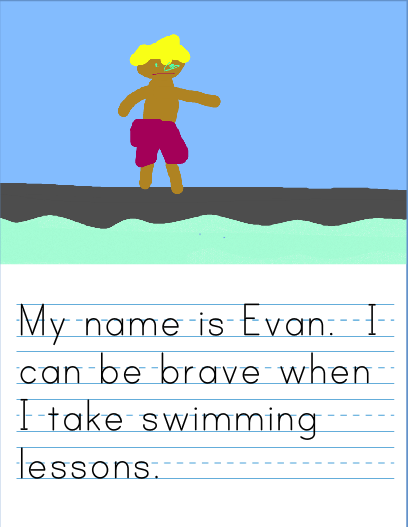 I can't wait to try out some more of the fun games and activities that my colleagues around the world are creating -- and I can't wait to try and and create my OWN games to share with them. 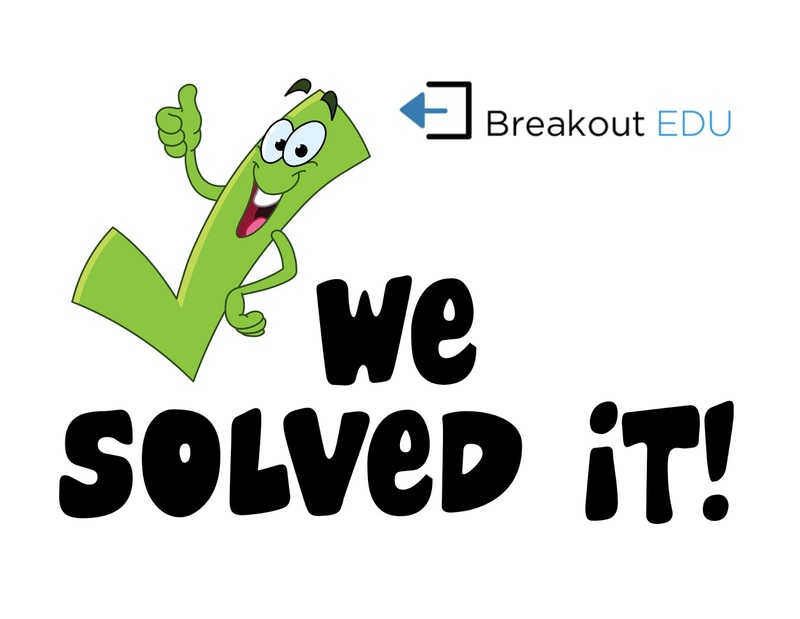 I encourage you to investigate BreakoutEDU. Give it a try. Being BRAVE is the #1 rule in my classroom. I want my students to always dare to try. Dare to fail. Dare to succeed. Learning can happen in many forms. Only when we are brave and TRY, do we truly discover how far we can go. 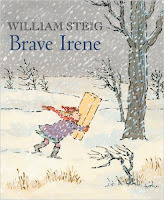 One of my favorite stories is Brave Irene by William Steig. I remember reading it as a child and it has always stuck with me. I have the Scholastic Video Collection DVD that has this story (it also has The Dot (by Peter Reynolds) and Amazing Grace (by Mary Hoffman) on it as well) and recently shared it with my First Graders. They loved it!! After they watched the video, we discussed how Irene showed bravery. The children were actively participating in this conversation and really seemed to relate to Irene. I asked them how they have shown bravery in their own lives. I was amazed at some of the answers. I heard everything from taking swimming lessons, learning to ride a bike, moving to a new school, and even going to my grandma's funeral. (That one broke my heart!) I have a some pretty brave students!! I recently was reminded about ABCya's Story Maker by my friend and fellow blogger, Susan, from The Digital Scoop. She gives a really good break down of the website and how to use it in one of her latest posts. I decided to show my "littles" how to navigate the program and asked them to draw a picture of them doing something that required them to be brave. We then used the text part of story maker to write a small caption that explains their picture. They turned out AMAZING! We are going to be putting them up in the hallway and making a "Hall of Bravery". I am so excited! My great friend and colleague, Susan Prabulos, and I were asked to speak once again at FETC - Future of Education Tecnology Conference - this week. We presented a session titled "Code Like A Boss". We had a great time collecting all the projects and ideas for this session and hope that you find them useful! Please feel free to contact us if you have any questions! Our information is located in the slides. 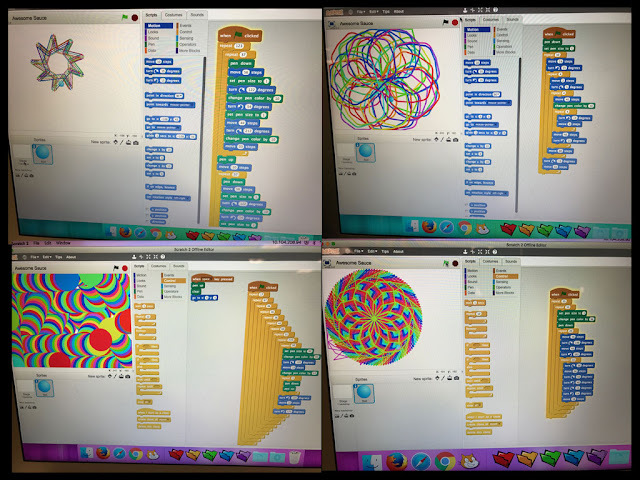 One of the favorite things my kiddos love to work with is Scratch - the coding and programming application by wonderful folks at the Lifelong Kindergarten Group at the MIT Media Lab. They LOVE learning about all the possible ways to create and code using this program. As I was looking through some curriculum connections, I ran across a lesson I used to do with Idioms using Photoshop Elements. Students would use the tools to draw an image that was a literal interpretation of the idiom. If the student had the idiom, "Painting the town red" -- they would draw a city scene and have a little figure painting everything red. Pretty fun! 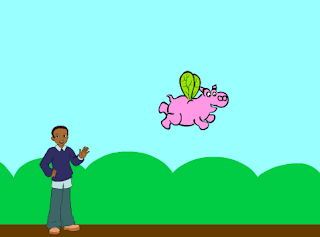 However, I realized that it would be even MORE fun to try and have the kids use the tools and commands in Scratch to create a mini animation of an idiom. I spent some time talking about what an idiom is ... and that it could have a literal meaning ... as well as the more appropriate figurative meaning. Everyone agreed that the literal meaning is very funny when you stop and think about it. After I explained the concept of our assignment and reviewed some of the basic commands they may need to use -- the kids "took off like a jet plane". We are having such a great time trying to make our idioms come to life with coding. Below are a couple of examples....hope you find this "easy as pie".